The mixed-use development planned for the Pavilion on Northbourne Hotel site. Images from the DA. Two more pieces of the Northbourne Avenue renewal jigsaw are coming into play with development applications lodged for the redevelopment of the Pavilion Hotel in Dickson into nearly 400 units and the construction of a 10-storey mixed-use tower on the Macarthur Avenue corner in Turner. The Pavilion on Northbourne Hotel at 242 Northbourne Avenue will make way for four buildings that will house 394 one to three-bedroom units, home office suites, a gym and commercial spaces. The $145 million development will consist of two parallel north-south buildings, a ‘U’ shaped building to the south of the site, all nine-storeys, plus a smaller three-storey building on the eastern edge of the site fronting Dooring Street. It will be completed in two stages, the first being a ‘U’ shaped building, with the Pavilion continuing to operate while it is being constructed. The second stage will see the Pavilion demolished and the construction of the three other buildings. A total of 880 parking spaces will be provided in the basement levels of the proposed buildings, above requirements. The traffic report says the proposed development will generate a net total of 100 trips in the AM peak and 126 trips in the PM peak, once the traffic generated by the existing hotel use is omitted, but will only have a minimum impact on nearby intersections. The internal courtyard and walkway of the Pavilion development. The 12-hectare site is bound by Northbourne Avenue to the west, the proposed SOHO development to the north, Dooring Street to the east, and the ABC Studio building and Adina Serviced Apartments to the south. 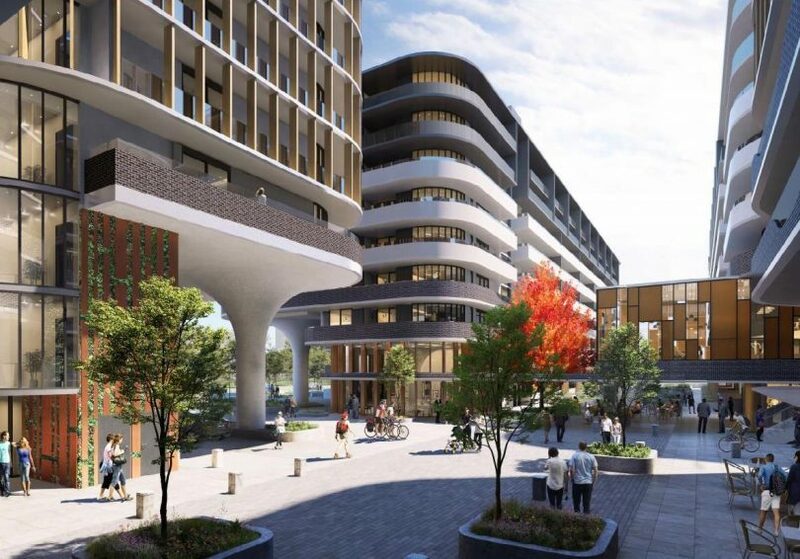 The DA, prepared by Purdon Planning for Kappelle Pty Ltd, says the proposal is an exciting, innovative and efficient high-density mixed-use design on a prominent inner-city site adjacent to the new light rail and the proposed ‘Macarthur Urban Village’. “The site layout makes provision for deep-rooted planting along the Northbourne Avenue frontage and generous landscape areas within the site and on rooftops. The shared laneway design will add a fine-grained interest to the development in a safe and secure landscaped setting,” it says. A walkway connection from Northbourne Avenue to Dooring Street will be activated through small-scale commercial uses and areas of open space. The DA says the location will support a high level of active travel because of its proximity to job centres, shopping, entertainment, open spaces and community facilities. The site is also immediately adjacent to a light rail station. It will make an important contribution to the broader ACT Government vision for an attractive and active Northbourne Avenue corridor, the DA says. A rendering from the DA of the proposed Midtown tower. 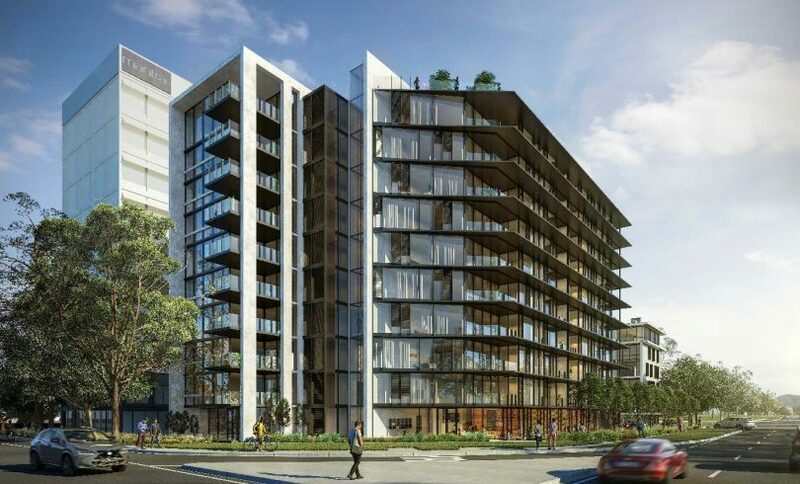 Meanwhile, HTI Group Pty Ltd has lodged a development application for the third stage of its Midtown mixed-use precinct, which has seen the Northbourne House office tower transformed into the Mantra MacArthur Hotel and the construction of the Edgeworth Apartments fronting David Street. The nearly $10 million development will consist of a three-level basement car park, six commercial ground floor tenancies on the ground floor with structured car parking at the rear of the building, and nine storeys of 81 two and three-bedroom apartments crowned by a rooftop garden. The DA, prepared by Canberra Town Planning, says the proposed development will be a landmark building on the corner of Northbourne and McArthur Avenues with a strong architectural design and style. “The landscaped forecourt to the building along the streets will provide opportunities for active commercial uses to ‘spill’ into the streetscape and present activity to the adjoining public realm”, it says. The development will mean the loss of one regulated tree. Both developments will require changes to the Crown lease to add residential use.